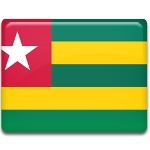 The Togolese Republic, commonly known as Togo, celebrates its Independence Day on April 27. This public holiday commemorates the proclamation of the independence of Togo from France that occurred in 1960. The first Europeans to arrive in what is now Togo were Portuguese explorers Pêro Escobar and João de Santarém in the late 15th century. The Portuguese established a small fort named Porto Seguro and did trade there. For the next two centuries, the region was a major center of slave trade, earning itself the nickname “The Slave Coast”. Togo was one of the last regions in Africa to be colonized by Europeans, in the process known as the Scramble for Africa. In 1884, Germany established two separate protectorates here that were promptly merged into a single protectorate named Togoland, stretching along the Slave Coast. Togoland had a highly developed infrastructure to facilitate the export of its main crops (cotton, coffee and cocoa). Despite its small size, Togoland was considered one of Germany’s most valuable colonies because of its ability to support itself. After the outbreak of World War I, Togoland was occupied by British and French troops. There were no military personnel stationed in the protectorate, only the police force. In late 1916, the protectorate was divided into British and French administrative zones. Following Germany’s defeat in the war and the signing of the Treaty of Versailles, Togoland was formally divided into two League of Nations mandates, French Togoland and British Togoland. Interestingly, newly founded Czechoslovakia tried to acquire the colony, but the attempt was unsuccessful. When the League of Nations was replaced by the United Nations after the end of World War II, the mandate became a United Nations trust territory administered by the United Kingdom and France. The UK administered British Togoland as part of the British Gold Coast, and its residents eventually chose to join the newly independent nation of Ghana rather than merge back with French Togoland. Meanwhile, French Togoland began to gain more autonomy. In the 1946 Representative Assembly elections, the majority of seats were won by the Committee of Togolese Unity, and the party’s leader Sylvanus Olympio was elected President of the Assembly. In 1955, French Togoland gained the status of an autonomous republic within the French union and was granted considerable power over its internal affairs. These changes were formally enshrined in a constitution adopted in 1956. Two years later, a parliamentary election was once again won by Sylvanus Olympio’s pro-independence party. Several months after the election, France officially promised to grant the Republic of Togo full independence, a decision that was supported by the UN General Assembly. On April 27, 1960, Togo became a fully independent state after a smooth transition period, with Olympio as its first president. Independence Day in Togo is a national holiday and an official non-working day. It is marked with speeches by the president and government officials, military and civilian parades, and other events and festive activities.